My Quilt Infatuation: Party Time, Friends! Welcome to Needle and Thread Thursday, y'all! It has been one busy week for me. It's testing week. It really is an unfortunate reality that so much rides on student performance on three days of testing, but it is what it is. After finishing up my Bubble Bath pattern, I got to work on this sweet baby quilt. 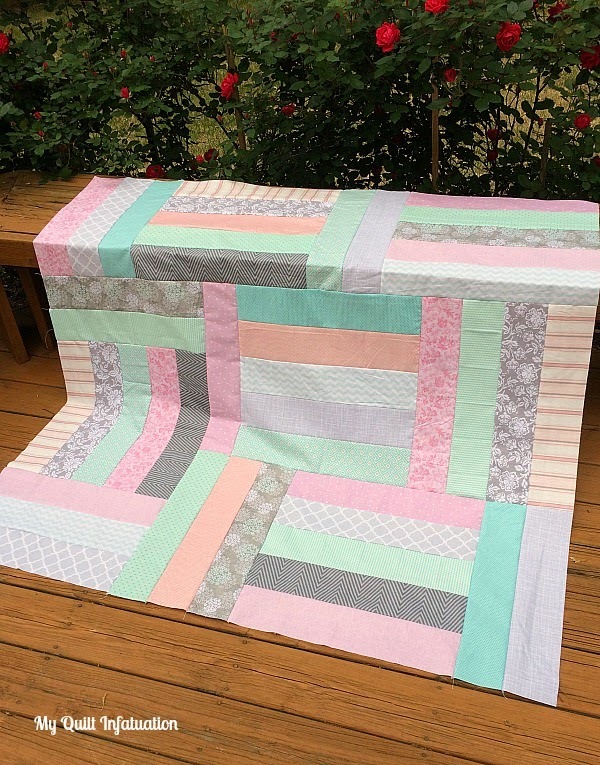 Low volume is not something I usually gravitate to, but the soft shades of pink, gray, and aqua in this quilt will match her nursery perfectly. I used my Strip Tango tutorial. I needed this quilt in a hurry, and this pattern is always quick and fun to put together. I also had some time to check out all of the quilty awesomeness from last week's party. Although I don't get as much time to do it as I would like, reading blogs is always a huge stress reliever for me, and last week's party certainly did not disappoint! 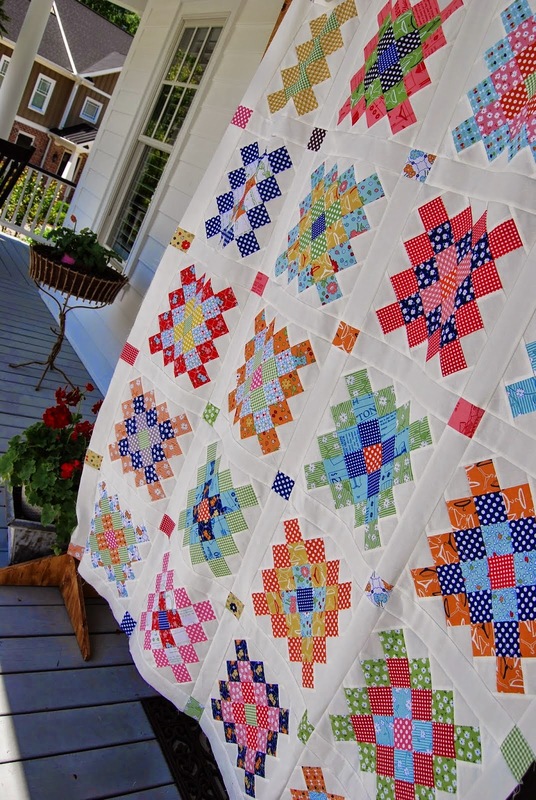 Leland Avenue Studios shared this fantastic plus quilt. What gorgeous photos! 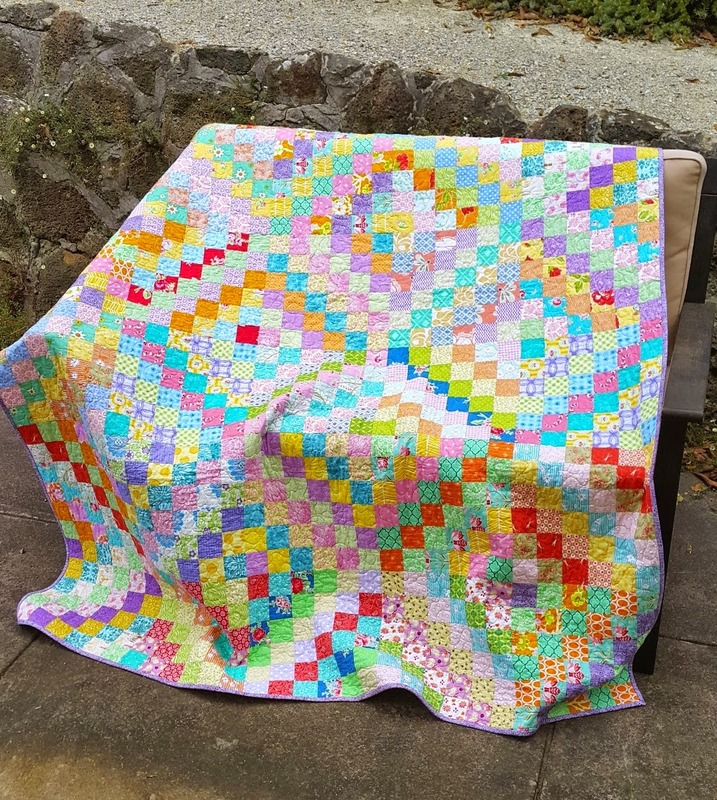 Pedal Sew Lightly linked up her bright and cheery granny square quilt. and last, but not least, Curlyque Sue showed off her beautiful and colorful finished Scrappy Trip. Okie dokie, friends! It's time to show off your latest creations! 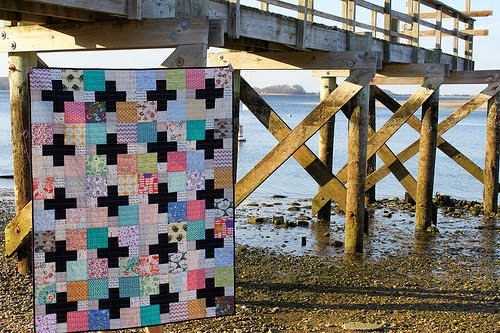 well of course I love that Granny Square quilt seeing as I am quilting one at the moment! Love the soft colors in the baby quilt. All the featured quilts are gorgeous, it's hard to pick a favorite. Thankfully Dear Daughter has taken and passed her last required end of instruction exam. She has passed all 4 of the required exams for graduation. Now she can enjoy her last 2 years of high school and not worry about any other end of instruction exams. I love the soft colours in the baby quilt. I prefer pastels for very young children; very bright colours a good when they're older. I just came across your Strip Tango Tutorial through Fort Worth Fabric today (!!) and thought...I'm gonna give that a shot! I have several Old New 30s by Lecien that I adore and decided to use that. And...since this is only the second quilt I've ever made (attempted) and the first one that actually involved cutting (first one was charm squares), I've already screwed up. Measure twice, cut once. Also, read the instructions and maybe actually write the measurements down before you go to your cutting board. ::weep:: So...my strips are 20 by 4.5 instead of 20.5 and I'm trying to figure out how I'm gonna salvage it. I think it will just be a strange size, but that's ok. I hope. Thanks for the great tutorial - looking forward to seeing how it turns out. Inspiring highlights this week!! Love the "softness" of the colors in your baby quilt. Thanks for the linky!